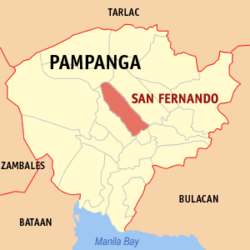 San Fernando, officially the City of San Fernando (Kapampangan: Lakanbalen ning San Fernando; Tagalog: Lungsod ng San Fernando), or simply referred to as San Fernando City, is a 1st class city and capital of the province of Pampanga, Philippines. According to the 2015 census, it has a population of 306,659 people. 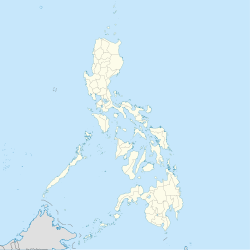 It is the regional center of Central Luzon and located 66 kilometres (41 mi) north of Manila, 73 kilometres (45 mi) east of Subic in Zambales, and 17 kilometres (11 mi) south of Clark Air Base in Angeles City. The town of San Fernando was founded in 1754 from the towns of baliti Bacolor and Mexico. The first church was built in 1755 with wooden walls and nipa roofing. The municipal tribunal was erected later in the year in front of the town plaza using durable materials and thatched nipa roofing. Don Vidal de Arrozal served as its first gobernadorcillo that year. In 1796, after serving as gobernadorcillo the previous year, Don Ángel Pantaleon de Miranda retired to Barrio Saguin, from where he started setting up his hacienda in Barrio Culiat. The barrio was separated from San Fernando on the December 8, 1829 as the new town of Angeles, with the Los Santos Ángeles Custodios as titular patrons. An expediente requesting the transfer of the provincial capital of Pampanga to San Fernando was signed on the August 6, 1852. Real Cedula 745, approving the transfer of the provincial capital of Pampanga from Bacolor to San Fernando, was signed on September 11, 1881. This transfer did not, in the event, materialize. In 1878, actions were made to create the town of Calulut. This new town would be composed of Calulut and the neighboring barrios of Bulaun, Malpitic, Sindalan, La Paz, Lara, Saguin, Telabastagan, Balete, Malinao, Pulung Bulu, Panipuan, Macabacle and the caserio of Pau in San Fernando, and Panipuan, Acle, Suclaban and the sitio of Gandus in Mexico. This plan did not materialize, owing to strong opposition from the parish priest of San Fernando. Governor-General Eulogio Despujol and Manila Archbishop Bernardino Nozaleda inaugurated the San Fernando railroad station, together with the Bagbag-Mabalacat stretch of the Manila-Dagupan Railroad, on February 2, 1892. The station was second only to Manila in revenues that year, and was thus the most important provincial station of the Manila-Dagupan Railroad. On June 27 of the same year, Dr. José P. Rizal made a stopover in the town as part of his mission to recruit members to the La Liga Filipina. On September 1, 1896 the town was declared to be in a state of war despite its peaceful situation. Brigadier General Diego de los Rios arrived on December 2 to calm the revolution that started in Manila on August 30. General Ruiz Serralde took over Rios's post on June 26, 1897 to maintain the peace in San Fernando. The revolution was not yet at its height with occasional exchanges of fire in some places in Pampanga. On June 26, 1898, representatives from all Pampanga towns, except Macabebe, gathered in San Fernando to swear allegiance to Gen. Maximino Hizon, who was the provincial military governor and representative of the revolutionary president, Emilio Aguinaldo. On October 9, Aguinaldo and his cabinet visited the town, and were welcomed with so much applause and enthusiastic cheering from the public. He proceeded to the convento which was served as the military headquarters at that time. On May 4, 1899, Philippine revolutionary troops led by General Antonio Luna burned the casa municipal, the town church and several houses to render them useless to the approaching American forces. On June 16, due to the strategic location of the town, Aguinaldo himself led Filipino forces in the Battle for San Fernando. The plan to retake the town proved unsuccessful. Calulut fell to the Americans on August 9. On August 15, 1904, the Pampanga provincial government was finally transferred to San Fernando from Bacolor, by virtue of Act No. 1204 signed on July 22, 1904. This was during the term of Governor Macario Arnedo and Municipal President Juan Sengson. The town of Minalin became part of San Fernando that same year. It would regain its political independence in 1909. On January 2, 1905, the town of Santo Tomas was consolidated with San Fernando by virtue of Act 1208. On August 12, 1904, U.S. Secretary of War William H. Taft visited the town to get first-hand information and gather ideas for the governance of Pampanga. Owing to the short notice, a bamboo pavilion was hastily constructed for his visit, where he was welcomed with a banquet for 200 people. Taft would later be elected President of the United States. In 1921, the Pampanga Sugar Development Company (PASUDECO) sugar central began its operations. The company was formed in 1918 by large-scale planters such as José de León, Augusto Gonzales, Francisco Tongio Liongson, Tomás Lazatin, Tomás Consunji, Francisco Hizon, José Henson, and Manuel Urquico in the San Fernando residence of Governor Honorio Ventura as part of a plan to construct a locally financed central. In 1932, the Socialist Party of the Philippines was founded by Pedro Abad Santos. Two years later, he created and headed the Aguman Ding Madlang Talapagobra (AMT). The Abad Santos compound in Barangay San Jose became the focal point of the peasant movement. On February 14, 1939, Philippine president Manuel L. Quezon proclaimed his social justice program before a gathering of farmers in front of the Municipal Government building. In 1941, forces of the Imperial Japanese Army occupied the town and placed the municipal government under its supervision. The following year, thousands of Filipino and American prisoners of war walked from Bataan to the San Fernando Train Station in what will be known as the Bataan Death March. In 1952, the town of Santo Tomas was separated from San Fernando. In 1986, Paterno Guevarra was sworn in as officer-in-charge of the town after the successful People Power Revolution that toppled the Marcos dictatorship that same year. He was later elected municipal mayor. In 1990, Philippine president Corazon C. Aquino inaugurated the Paskuhan Village, the first Christmas village in Asia and the third of its kind in the world. The following year, Mount Pinatubo erupted after over 600 years of dormancy hurling a layer of ash and volcanic debris on the town. On October 1, 1995, Typhoon Sibyl (Mameng) struck the town. It unleashed floodwaters and mudflows from Mount Pinatubo into the town. The Barangays of Sto. Nino, San Juan, San Pedro Cutud and Magliman were severely damaged by lahar. The citizens of San Fernando rallied to save the town by raising funds to build the St. Ferdinand People's Dike. The Pampanga Megadike was constructed the following year, thus preventing further damage to the town. On January 6, 1997, Mayor Rey B. Aquino and Senator Gloria Macapagal-Arroyo launched the campaign for cityhood. On April 27 of that same year, Rep. Oscar Rodriguez filed House Bill No. 9267 creating the City of San Fernando. In 2000, House Speaker Arnulfo Fuentebella and Senate President Aquilino Pimentel Jr. signed the approved city charter of San Fernando on December 4 and 13 respectively. The town officially became a component city on February 4, 2001 following the ratification of Republic Act 8990 in a plebiscite from the previous day, making it the 99th city in the Philippines. Dr. Rey B. Aquino was the city's first mayor. The Roman Catholicism is the majority religion in the city; 80% of the population profess it. The city is under the Roman Catholic Archdiocese of San Fernando headed by Florentino Lavarias. Other religion includes Protestantism and Independent Christianity. Islam is also evident in the city. The seat of the Archdiocese of San Fernando is located in the city, the Metropolitan Cathedral of San Fernando. Strategically located at the heart of the province, the City of San Fernando is home to two public markets, thirty-nine banks, forty-eight lending institutions (investors), thirty-eight pawnshops, seventeen gasoline stations, three movie houses, thirty-nine public and private schools, seven hospitals, thirteen dental offices, nine hotels, twenty-eight drug stores, seven disco clubs, six foreign exchange firms, fifteen garment factories, twenty-four groceries, seven supermarkets, forty-two insurance companies, sixteen security agencies and seventy restaurants and fast food chains such as Jollibee, McDonald's, Mr. Donut, Greenwich, Shakey's, and Chowking. In addition to being the Provincial Capital of Pampanga, almost all Philippine banking institutions, military and governmental agencies have regional offices in the City of San Fernando.SM City Pampanga is a large shopping mall owned by Henry Sy, Sr. and his company, SM Prime Holdings. It is the very first SM Supermall in Central Luzon. Robinsons Starmills Pampanga or Robinsons Starmills is a shopping mall owned and operated by John Gokongwei and his company, Robinsons Malls, the second-largest mall operator in the Philippines. This is the very first Robinsons Mall in the Central Luzon and in the Pampanga Province, rivaling adjacent SM City Pampanga. The mall is located at Jose Abad Santos Avenue, Barangay San Jose, San Fernando, Pampanga and Barangay Lagundi in the neighboring town of Mexico, Pampanga with a total floor area of 62,000 square meters (667,120 square feet). San Fernando serves as one of the agricultural processing center of Central Luzon. It is a major rice-producing region and an important sugar-producing area. The Pampanga Sugar Development Company (PASUDECO) was once the largest private employer in Pampanga. It is a major sugar-processing plant in the region. Other manufacturing companies with offices in the city include Universal Robina Corporation, Zuellig Pharma Corporation, Nestlé Philippines, JBTEC J1, Petrophil, Mondragon Industries, Asia Brewery, and Del Monte Corporation. Major bottling companies such as the San Miguel Corporation Complex, Coca-Cola, Pepsi Cola, Cosmos and Metrobottling, Pampanga's Best Inc. are located within the city. Every year during the Christmas season, the city becomes the hub of a thriving industry centered on handcrafted lanterns called parols. What distinguish the San Fernando lantern from the ordinary parol are the intricate designs and the illusion of dancing lights, which focuses on the vibrant colors of the lantern. Also, every year around Christmas time, there is a town lantern festival. Different neighborhoods around San Fernando, come together for a friendly competition to see which neighborhoods lanterns are the best. The festival itself is held in the middle of December, rooted back to the city of Bacolor. The transfer from the city of Bacolor to the city of San Fernando in August 1904. In the dialect of Kapampangan, this event is called "Ligligan Parol". But, for many who have experienced this say that "Ligligan Parol" did not actually quite happen. Especially following up the immediate transfer of customs between the 2 cities in the year 1908. It went on to be a tradition that has evolved as the lantern gradually became larger and larger and more intricate each year. Years later, the lantern itself was a symbol for the resident contribution, benefiting their labor. The sole purpose of these lanterns symbolized the unity amongst different neighborhoods. The City of San Fernando has four TV stations - KTV Channel 12, Infomax Channel 8, Central Luzon Television Channel 36 (CLTV36) and ABS-CBN TV-46 Pampanga. There are also two radio stations, the 5 Kilowatt RW 95.1 FM of the RadioWorld Broadcasting Corporation of the Philippines and the 2.5 kilowatt 92.7 Brigada News FM Central Luzon of the Brigada Mass Media Corporation. Several local newspapers are published in the city which includes SunStar Pampanga, The Probe, Coffee Punch, Pampanga Times and the Observer. This is the list of the mayors of City of San Fernando. La Plata Science and Technology, Inc. Bright Ways School Systems Inc. The monument tells the 4-fould aspect of the Fernandino story: a) the penitent girl with lantern, b) lady with torch, c) lady making the offering and d) boatman. The February 4, 2004 (dedicated by Mayor Rey B. Aquino) Monumento Fernandino is a sculptural masterpiece that pays tribute to the city's colorful history and cultural heritage. Its artistic composition when seen from a distance would seem like a sprouting plant amidst a barren landscape. Formerly known as the Paskuhan Village, located at the mouth of the San Fernando Toll Exit along the North Luzon Expressway, North Philippines Hilaga was transformed into a cultural, historical, tourism, trade, and entertainment village by former Secretary Richard J. Gordon in 2003. Its design and concept make it a virtual window to the cultural and historical heritage of the four regions of the North Philippines as well as a showcase for their indigenous products, and arts and crafts. The star-shaped pavilions at the center pays tribute to the skilled lantern makers of San Fernando, Pampanga which produces the biggest lanterns in the world. The complex features a 1,000-seat capacity air-conditioned pavilion for conventions and special events, an open-air amphitheater for outdoor activities, air-conditioned exhibit halls, trade booths, garden restos and a 60-seat capacity conference hall. Located in Skyranch Pampanga beside SM City Pampanga, the Ferris wheel is the tallest in the country with 65 meters in height and a diameter of 50 meters. Bren Z. Guiao Sports Complex and Convention Center is a multi-purpose complex with imposing venues for concerts, convention, basketball games, beauty pageants and other sport activities. The 3,000-seat, air-conditioned convention center inside the complex is one of Pampanga's pride. The Archdiocesan Museum and Archives of the Archdiocese of San Fernando is housed at the University of the Assumption, and includes antiques and exquisite works of art depicting Pampanga's rich cultural heritage. It contains numerous ecclesiastical artifacts ranging from a huge churchbell to paintings; ivory and wooden statues of all shapes and sizes, vestments worn by priests during Mass and chalices, monstrances, reliquaries and ciboriums made of gold, silver and precious gems, some dating back to the 17th century. As the province of Pampanga is regarded as the "Culinary Capital of the Philippines", the capital city of San Fernando is home to one of the oldest restaurants in the province - Everybody's Cafe. Located along McArthur Highway in Barangay Del Pilar, this iconic restaurant was built in 1946 by the Jorolan Family and is famous for exotic Kapampangan dishes such as betute (stuffed frogs), kamaru (crickets) and Pindang Damulag (carabao meat). Everybody's Cafe has been featured in international TV shows such as Discovery Travel and Living's Bizarre Foods by Andrew Zimmern and Bobby Chin's World Cafe Asia. Lantern Factories - Several lantern factories can be visited in Unisite Subdivision, Barangay Del Pilar, as well as in Barangays Santa Lucia, San Jose and Dolores. Oscar Albayalde, Police officer who serves as the 22nd chief of the Philippine National Police. Honesto Ongtioco, first Bishop of the Diocese of Cubao, Quezon City and formerly the second Bishop of the Diocese of Balanga, Bataan. ^ a b Henares, Ivan Anthony S. "A Brief History of San Fernando, Pampanga 1754–2004"
^ Province of Pampanga, A Profile of Region III Archived 2006-08-21 at the Wayback Machine September 2001. ^ "Department of Tourism - The Philippines Ultimate Travel Guide for Tourist". visitmyphilippines.com. Wikivoyage has a travel guide for San Fernando, Pampanga. 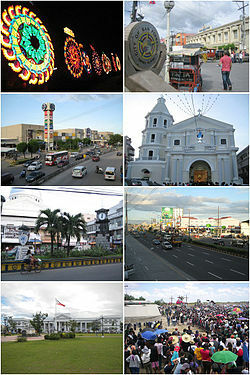 Wikimedia Commons has media related to City of San Fernando, Pampanga. Wikisource has the text of a 1905 New International Encyclopedia article about San Fernando, Pampanga.